The new N-Tron series NT24k-16M12 IP67 managed Gigabit Ethernet switch provides a rugged, dust proof and water resistant enclosure with sixteen Gigabit coded ports to create a reliable and secure communication network for equipment in harsh environments. Red Lion Controls have announced new additions to its N-Tron series of industrial Ethernet switches. The new Power over Ethernet (PoE) and non-POE models are designed for industrial applications requiring reliability, Gigabit performance, advanced management features and ease of use. Rugged and reliable, these units maximise network uptime, even in the harshest conditions or applications which suffer from motion and/or vibration. 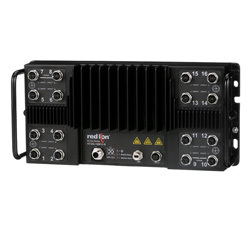 Red Lion’s new IP67 managed Gigabit Ethernet switches provide a rugged, dust proof and water-resistant enclosure with sixteen 10/100/1000Base-T(X) M12 X-coded ports to create a reliable and secure communication network for equipment in harsh environments. They are ideal for harsh manufacturing or other industrial applications subject to shock, vibration and extreme temperature conditions. With the bypass relay option, data will continue to flow through the bypass relay ports even if the power fails. The new models offer secure M12 copper ports, plug and play operation, bypass relay port options, robust remote monitoring, N-Ring™ and N-Link™ ring technology and N-View™ device monitoring and firmware management technology. NT24k-16M12: Industrial managed Gigabit Ethernet switch provides 10 to 49 VDC redundant power inputs and a -40° to 85°C wide operating temperature. The NT24k-16M12-R also offers two bypass relay port pairs. NT24k-16M12-POE: Industrial managed Gigabit POE+ switch provides IEEE 802.3af/at PoE output, 240 watt POE budget configurable across all 16 ports, up to 30 watts per port, 22 to 49 VDC redundant power inputs and a -40° to 80°C wide operating temperature. The NT24k-16M12-POE-R also offers two bypass relay port pairs. The new NT24k-16M12 switches are CE, UL Class 1 Div 2 and rail certified. Red Lion’s industrial networking portfolio offers customers a wide variety of options that drive operational efficiencies while addressing industry demands. If you would like specific advice on these products or any aspect of industrial networking, please call our head office sales department on 01254 685900 and speak to one of our Technical Support Engineers. They will be happy to discuss your requirements and advise you on the best solution to your specific network application.